Qumulo’s file system is a scale-out and scale-across network-attached storage (NAS) solution for enterprises. ”Scale-across” is a term used to describe storage that scales both capacity and performance seamlessly across environments (including on-premise and cloud). Qumulo Core is the software that runs on each node of a Qumulo cluster. Qumulo’s file system spans the data center and the public cloud. It scales to billions of files, costs less and has lower TCO than legacy storage appliances. It is also the highest-performance file storage system on-premise and in the cloud. Its built-in, real-time analytics let administrators easily manage data no matter how large the footprint, or where the data is located globally. Qumulo’s file system moves file data where it’s needed, when it’s needed – for example, between on-premise clusters and clusters that run in the cloud. Qumulo lets you store and manage massive data sets, in multiple environments, anywhere in the world. Qumulo’s software runs on industry-standard hardware on premise or on cloud instances and cloud storage resources. What’s included in a Qumulo subscription? Qumulo’s file system is comprised of both software and services. It’s available with simple and transparent subscription-based pricing. The diagram below illustrates what’s included in a Qumulo subscription. Qumulo software includes powerful real-time analytics and capacity quotas, as well as continuous replication and snapshots. 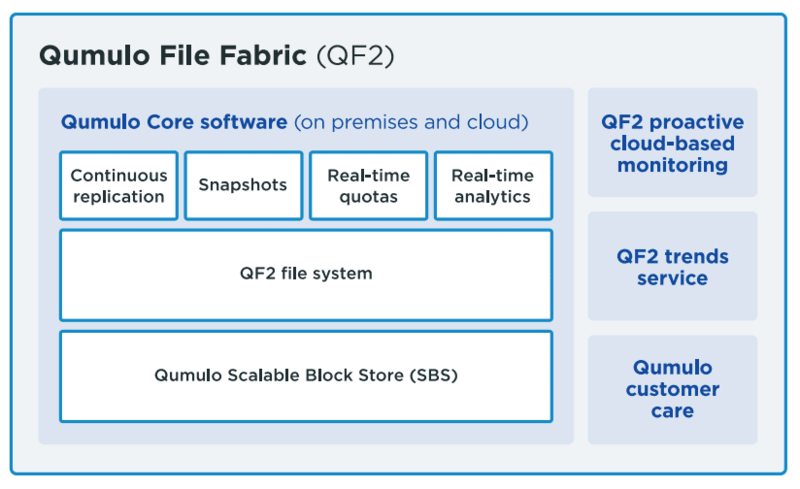 These features are built on the highly scalable Qumulo file system that, unlike other systems, includes integrated real-time aggregation of file metadata. The SBS is the block layer of the Qumulo file system, making it simpler to implement and extremely robust. SBS also gives the file system massive scalability, optimized performance, and data protection. Qumulo’s file system includes cloud-based monitoring and trends analysis with your subscription, along with comprehensive customer support. Cloud monitoring includes proactive detection of events such as disk failures to prevent problems before they happen. Access to historical trends helps lower costs and optimize workflows for best use of your storage investment.